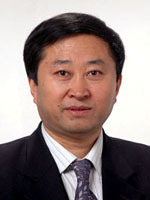 Born in September of 1956, Mr. Gong, a member of the CPC, PhD, is a professor and PhD instructor, UNESCO Chair in Hydroinformatics for Ecohydrology(http://www.unesco.org/new/en/natural-sciences/) and he is also a faculty member of the Russian Academy of Engineering, a faculty member of Russian Academy of Natural Sciences and honorary PhD of Psychology Normal University of Moscow. His other major social titles include member of the sixth Appraised Committee of Geographic Science of the Academic Degree Assessment Committee of the State Council; member of the Supervision Committee on the Teaching of Geographic Sciences for Institutions of Higher Learning by the Ministry of Education; deputy director of Teaching Supervision Committee for Institutions of Higher Learning; PhD instructor for Northeast Institute of Geography and Agroecology of Chinese Academy of Sciences and PhD instructor for University of Chinese Academy of Sciences; member of the National Disasters Control Committee; researcher specially hired by the Disasters Control Center; member of the expert team on geographic info for National Remote Sensing Center of China; and expert on the ecological and hydrological planning of the UNESCO; a guest professor of Hiroshima University of Japan; an expert on the Editing Committee of the Journal Water Research for the Asian Pacific Region; deputy chief editor for Journal on Natural Disasters and Earth Information Sciences; member of the editing committee on quite a few important journals such as Engineering Survey, Mountain Science, Hydrogeological Engineering Geology, and Geography and Geographic Information Science; vice chairman of the Geographical Society of China, deputy of director of the education committee of China Association for Geographic Information Society, and director of the Geographical Society of Beijing. Chronologically from 1986, 1993 to 1996, Mr. Gong studies at Geological Institute of Changchun (now Environment Institute of Jilin University) as an undergraduate, graduate and PhD graduate (from 1996-1998). He did his post-doctoral studies at the Remote Sensing Institute of Peking University. He is one of the most prominent teachers of the Ministry of Education and one of the top-notch innovators of Beijing. He has the subsequent titles as follow: director of one of the most important labs of the Ministry of Education for the acquisition and application of three dimensional information; director of one of the engineering research centers of the Ministry of Education for spatial information technology; and deputy director of the sub-division for eco-environmental process, which is under the research center of engineering technologies for the nation’s urban environmental pollution controls. Mr. Gong is largely devoted to the teaching and application research of the geographic information systems and remote sensing. He has been in charge of various projects of national importance such as the project of “863” and those funded by the National Natural Science Foundation of China. He has also handled, through joint efforts, some important projects run by mutual governments between China and France. He has made over 170 academic papers in a whole of journals and publications like Water Research, Systems Science and Information, and Sciences of China. Also he has published over 10 academic books and picture albums like Support Systems for Decisions on the Management of Urban Water Resources, Remote Sensing Picture Albums of the Biggest Flood Disaster in China in 1988 (editions both in English and Chinese), and Geographic Information Systems for Underground Water. Mr. Gong has reaped 7 awards for his teaching and research from the province and the ministry.